in extraordinary instances the cylinder with the gaseous extinguishing agent may be placed outside the casing of the AGC Master Extinguishing Apparatus or AGC Slave Extinguishing Apparatus – this procedure to be performed only by the producer of the device. active ingredients accumulation in the atmosphere – no aggressive ingredients. Time-delay relay switches off the power supply of cabinet’s ventilators (standard period of time when ventilators are switched off – 10 minutes) when the extinguishing agent is released. 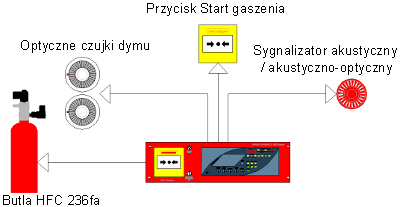 The device transmits signals not only to the outside devices – extinguishing control panels, visualization systems etc. – but is compatible also with SMS/Email-based notification systems. 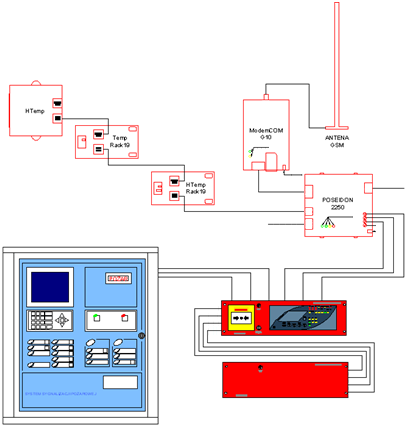 The device may inform the user about the fire detection, fire suppression or extinguishing apparatus’ fault. The gaseous extinguishing system HFC 236fa (FE-36) is based on hexafluoropropanol illustrated by the following chemical formula CH2F-CF2-CF3. The gas is colorless and odorless, and after compression changes its state into a liquid. The compression of the agent reaches 15 bars in 20°C after adding nitrogen. The gas is not harmful for people as well as for electrical devices placed in the air-tight cabinets. When the agent is released from the cabinet into the room the safety limits of the gas concentration are not exceeded. However, toxic chemical compounds are released into the air during the fire, hence the ventilation of the room is mandatory. Moreover, after the extinguishing procedure is done, fire security check must be carried out by the authorized personnel in order to eliminate the risk of another fire breakout.